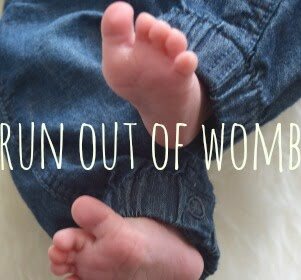 When the manic newborn phase fades and you start going out to meet non-sick-covered, bleary-eyed friends (aka those without babies), it's hard to tread a balance between filling them in on what's going on in your life (sleep woes, detailed chat about child's poo consistency, etc) and boring them to death / scaring them into celibacy. But recently I had a parenting photo which I showed some not-parents friends that made them go 'WOW'. It wasn't one of the 17 million cute baba photos I have on my phone. It wasn't even a funny baby poo-face meme, It was a picture of a buggy. Weird, right? 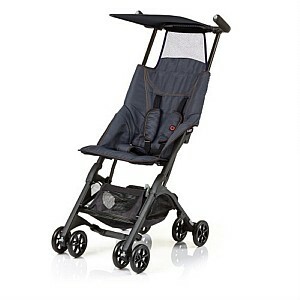 Especially as this buggy is no Bugaboo expense-a-thon or Cosatto-head-turner. It's plain black, costs £130 and comes from Mothercare. So what's cool about it? Look at this photo..
On the right you have a totally bog-standard rucksack; pretty small - Hirschel make, if you know it. And on the left? That's a buggy, which unfolds to a normal Maclaren-size stroll-a-round-town buggy. The Mothercare XSS Pockit buggy is even comfy and robust - although modelled here not by my not-so-tiny man, but his plastic chum Baby Annabel's brother George, because I was desperate to get this post up and tell you all about the Pockit XSS but the baba is napping. Usually you see these kind of origami baby gadgets and they're amazing, except when you have to fold them up or down. Well, to test the XXS out I didn't open its instructions and tried to shake out the buggy intuitively. It worked - easily up in 10 seconds, with one clip to undo and two wheels to pull out, then down in a slightly-longer 20 seconds, but that quickly cut down as I remembered how to do it. 2) It'll be fab for holidays, as it folds so small you can take it on-board planes and store it in the overhead locker, so no need to wait on landing and be the last people through immigration, or drag a tired child through an airport without a pushchair. 3) It'll fit it even the smallest car boots - and comes with a sunshade and small shopping basket. Oh, and then there's the price. I hankered after the ultra-foldable Yoyo Zen stroller for the above reasons - but it costs £320. Lots for a spare/second/travel buggy. But the XSS is less than half that cost - and has even won a place in the Guinness Book of World Records - for being the 'smallest commercially available folded pram'. When folded, it's 34 x 14 x 32 cm, whilst the buggy weighs just 3.9kg. Works for babies aged 6m to a max of 15kg. After six-months' use, though, I can report some downsides. On really cold days, it feels too open and chilly, when compared to travel systems or even McClaren-style umbrella strollers. And on really hot days? The sunshade isn't big enough and doesn't cover enough baby. When pushing, it's fine, but not amazing - a bit wobbly sometimes and doesn't feel that robust. Overall? It's a great compact buggy for nipping up to town and keeping in the car to dash into shops - but the poor sunshade and lack of protection means I wouldn't use this alone to travel on holiday, and that's a big downside. *This buggy was sent to Run out of Womb for review. Rest assured, though, that I'm seriously gobby and would never rave about something that's rubbish.